30 November 2018 – Dig Delve – An online magazine about gardens, landscape, growing & making. The woods in the hollow below us have finally been stripped of foliage to reveal bare bones and the silver-grey of the lichens that outline their trunks and branches. The garden has also dimmed, the last of the asters finally over and the summer foliage withered. In this new incarnation we are left with something altogether different. A garden still standing, but bleached of colour as it moves into the first throes of winter. Every week there are changes as the falling away reveals the skeletons that have the stamina to stand against the winter. The new transparency allows us to see to the ground now where the evergreen rosettes are already hunkered and providing new interest. Remarkable for the fact that they have been there in the shadows all this time and slowly building in strength are the Lunaria annua ‘Chedglow’. It was a delight to discover that the first generation of self-sown seedling have found their niche, nestled under the Salix purpurea ‘Nancy Saunders’ amongst the pulmonaria. 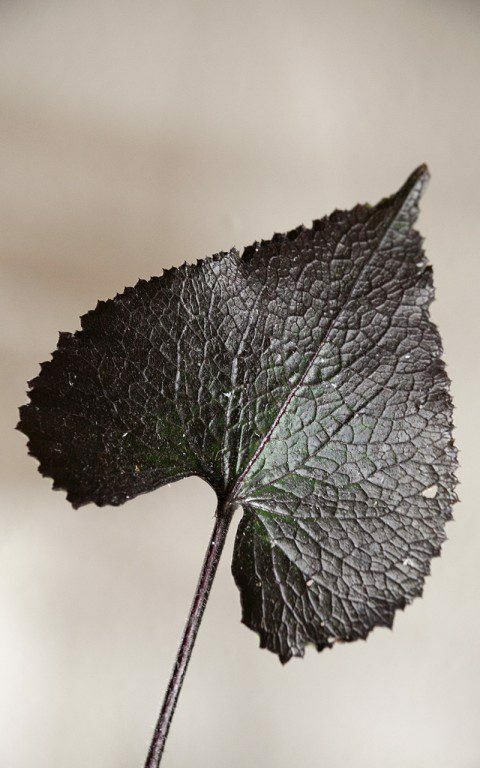 This dark-leaved honesty is a refined selection and more ornamental than most with its burnished, Ace of Hearts foliage. It is hard to describe the colour, which on close observation shimmers deepest purple over a base of bitter chocolate. Just discernible at the centre is a shading to dark forest green. 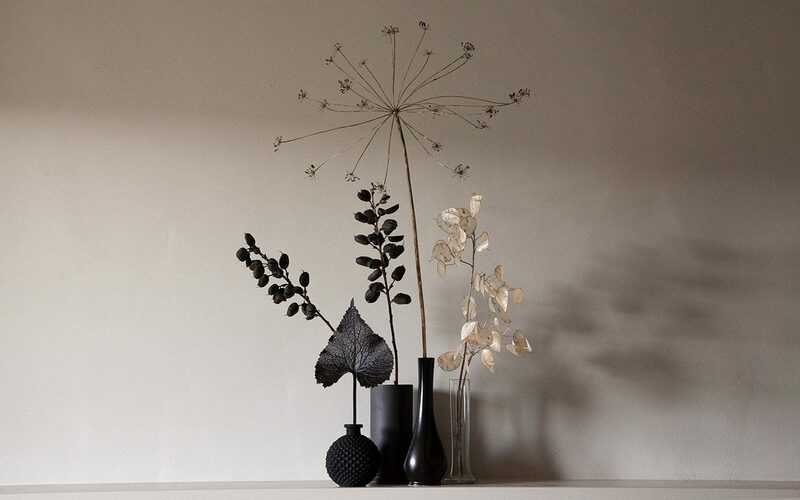 I have not yet built up a mix of generations in this young colony because my original plants flowered and seeded last year, but in time we will have enough plants for the satiny coins of seedheads to shine against this inky background. For now though the rosettes will provide a good foil for a group of February-blooming yellow hellebores that are clumping nicely and the lunaria flower, when it comes in April, will be a strong contrast to the primrose of the Molly-the-witch peonies which are also part of this grouping. ‘Chedglow’ has a good dark flower which is a dusky mauve, not the bright purple of the more commonplace honesty. Up by the barns and far away so that ‘Chedglow’ does not cross-pollinate and lose its lustre, I have Lunaria annua ‘Corfu Blue’. Though most are biennial, this particular form of honesty is said to be perennial. I am not sure that it really is, with only the odd plant coming again for a second year of flower, but the best ones are always those that seeded the year before and have built up a decent rosette in readiness. My original plants, which came from Derry Watkins at Special Plants, have now seeded freely in the gravel. 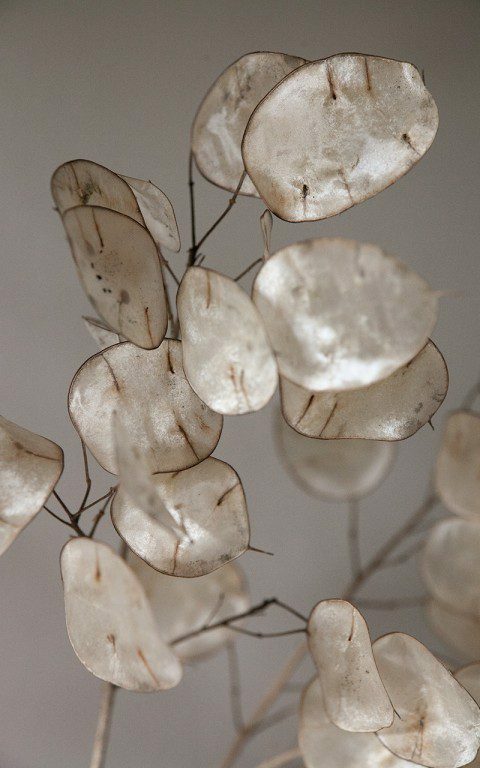 The flattened seedpods of lunaria are a magical thing as they develop, first green and then becoming pale and luminous like their namesake as they mature. The dark seed, also flattened, is suspended between three sheaths of papery tissue which silvers before buckling to drop its cargo in late summer. The remains of the honesty will be around for a while yet, capturing wintry light. 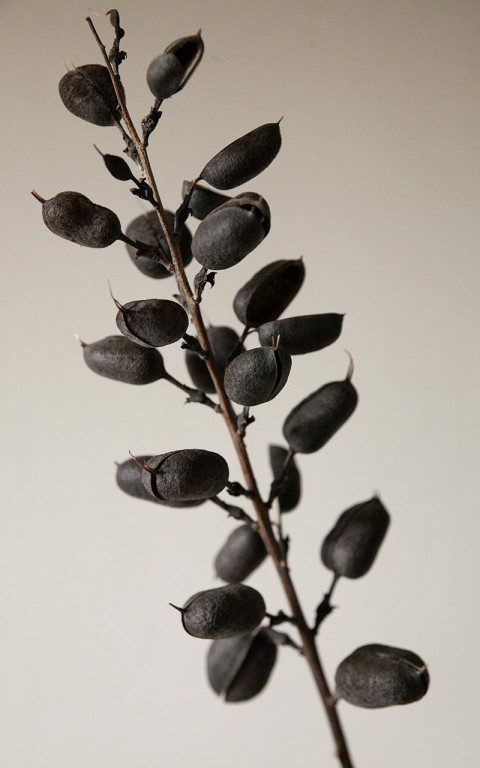 At the other end of the spectrum are the seedheads of baptisia, matt charcoal black when you see them suspended in a garden that is drained of chlorophyll. I have five or six different selections in the garden now, which are proving their worth both with their lupin-like flowers and good summer structure. In autumn each has its own habit, some colouring buttery yellow before the leaves fall, whilst others darken, the leaves metallic grey, like pewter and hanging on for quite some time before dropping. Here we have ‘Dutch Chocolate’, but ‘Caramel’ and ‘Starlite Prairieblues’ also produce a good seedheads. 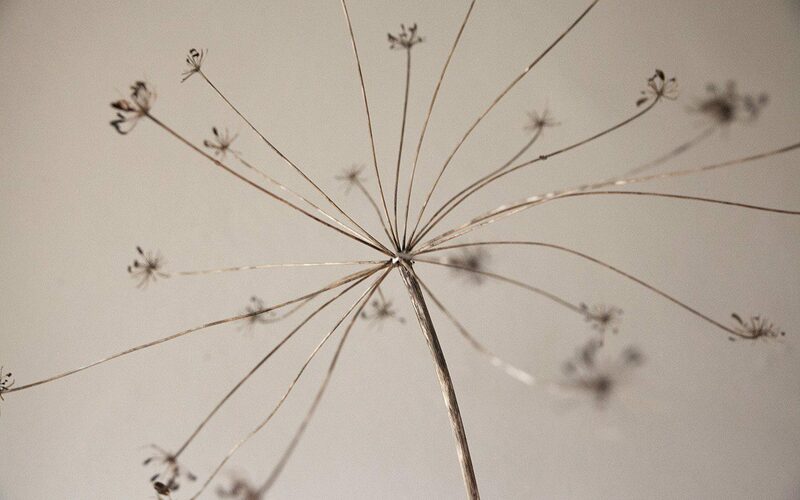 And finally, to give a feeling of the fragile remains in the garden this first week in December, are the spidery seedheads of Laser trilobum. This light-footed umbellifer moves away quickly from a glaucous leafy rosette in early summer to stand just over a metre high on wiry stems. The umbels can reach as much as 30cm across, so I give it plenty of room to hang loftily above low-growing Geranium macrorrhizum and white Viola cornuta. As an edge of woodlander it feels right amongst this cool greenery. Although it is reliably perennial, most of the seed has already dropped. It germinates easily in the right spot and, all being well, it will find its way into the planting on its own, to add the same dramatic delicacy of scale with its elegant, widely-spoked umbels, as it does here.